And just when everything was going swimmingly and it looked like I might catch up... the plague descended on Chez Sparkle. The past two days have involved a lot of creativity and bargaining in order for little Peanut to take her medicine and get on her way to feeling better. Timewise, these nails actually happened before my FLAG inspired nails. So, let's just jump in the T.A.R.D.I.S. and go back in time, shall we? My SUPERNATURAL nails were a little bit of a challenge. Not so much because of adding in the CRACKLE prompt. 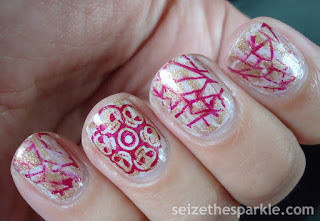 No... this was a lot of stamping error. 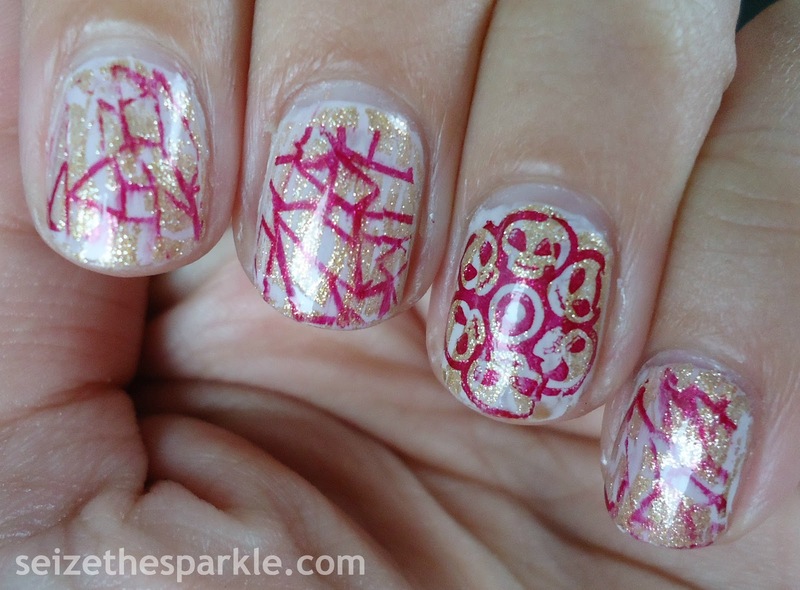 I tried to get the candy sugar skulls from BM-143 to go on my nails, but the outlines of the skulls are soooo thin. I stamped them onto both thumbs, but neither of them transferred perfectly. I decided I would come back to those later. For my ring fingers, I used the circular skull pattern. 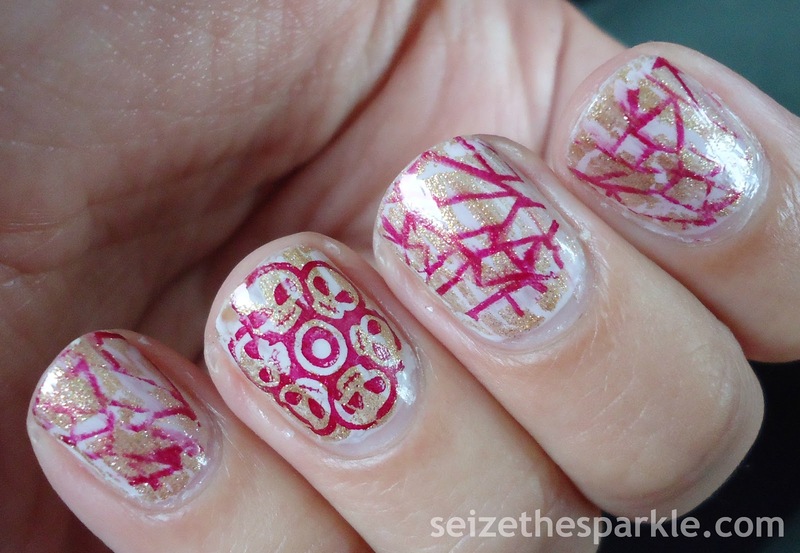 It's a bit of a thicker design, so it stamped onto my nails perfectly! 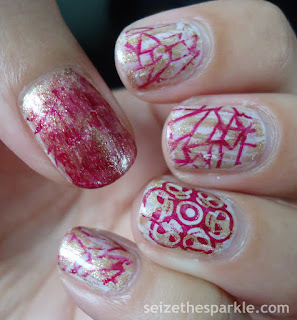 When I saw how gorgeously blood red Stop and Mel-the-Roses looked after stamping the skulls, I just had to stamp a little more! So, I grabbed BM-208 with the shattered glass pattern that I love and stamped all my nails. In the end, I love how these turned out. 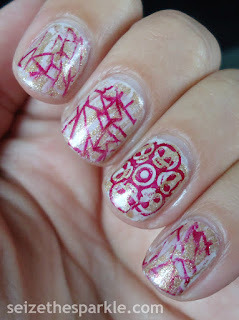 I was pleasantly surprised by the CRACKLE polish. I've got a couple in my stash, but I never really thought of layering over them until now. Definitely adds another layer of interest. 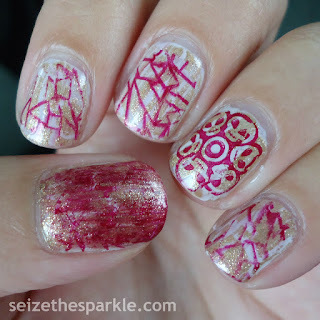 I'm thinking some of my CRACKLE polishes might lend themselves nicely to Seriotype manis in the future!